Exciting changes are underway in the Southfield City Centre, and a number of pedestrian improvements have been completed in 2012. These amenities will go a long way toward achieving the city’s vision of creating and maintaining a vibrant 24/7 pedestrian friendly mixed-use environment in the area. 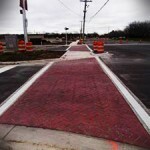 New pathways contribute to the walkable feel of the community. 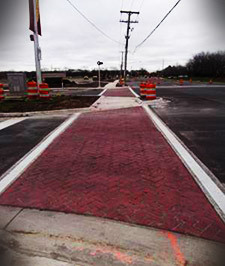 Over 700 linear feet of new 5-foot wide concrete sidewalk has been installed on the north side of Civic Center Drive, and nearly 400 linear feet are now in place on the east side of Central Park Boulevard. Over 400 linear feet of repaved 8-foot wide asphalt bike and safety paths now line the south side of Civic Center Drive, and 232 linear feet of asphalt pathways have been placed along Lawrence Technological University’s (LTU) athletic fields. Seven new decorative crosswalks were built at the intersections of Civic Centre Drive/ Central Park Boulevard and Civic Centre Drive/Northwestern Highway. Two median extensions now act as pedestrian safe harbors along Central Park Boulevard, and the city has also upgraded pedestrian crossing signals and ADA ramp installations throughout the district. 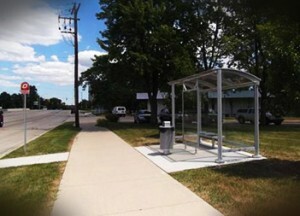 For pedestrian comfort, five SMART bus shelters have been installed in the Southfield City Centre, along with one solar panel bus shelter at Civic Plaza. 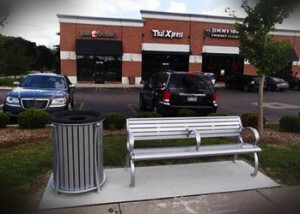 Six bike racks are now available throughout the area, along with eight backed benches and four flat benches. Seven decorative trash receptacles contribute to keeping the area clean. Two new gateways, plazas and accompanying landscaping mark LTU and Eaton Corporation, key points within the City Centre, contributing navigationally and aesthetically to the district. Signage at Oakland Commons has been refaced with the City Centre logo, and two Southfield City Centre gateway flags grace the north and south ends of Evergreen Road. Two new sets of banners, one for spring and one for fall, are on hand to contribute to the attractiveness of Central Park Boulevard. The reinvention of the Southfield City Centre into a walkable, pedestrian-friendly environment allows residents, office workers, students and visitors to spend their days in an environment catering to their lifestyles and interests. 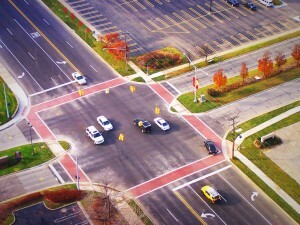 More improvements are slated for the future as the area continues to evolve into a vibrant place.